The name of the place comes from the local speaking phrase "Wide Seashore" and it means a seashore that has relatively big width, a spacious beach. It is one of the busiest beaches of Sifnos and it is considered one of the biggest beaches of Cyclades. 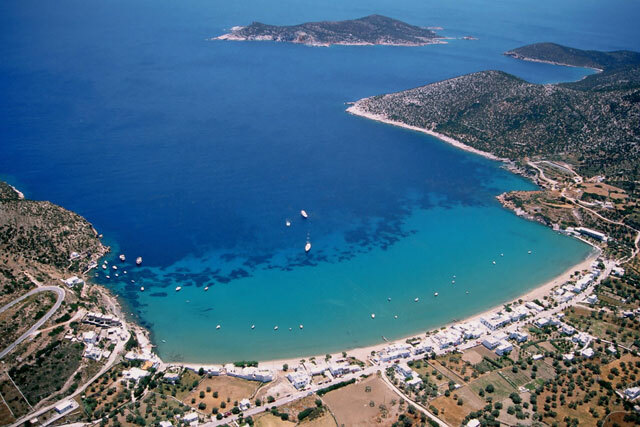 Also the beach of Platis Gialos has been awarded with the prize of the European Union's "Blue Flag" since it meets the required criteria of the project! North in the top of the hill dominates the monastery of "Panagia Vounou" (1813) from where the view is magnificent. SE is found the "Aspros Pirgos", the most famous from the 57 ancient towers of Sifnos. Southerly in the promontory of Platis Gialos a prehistoric cemetery was discovered. SE in the entry of bight is found the privately - owned and uninhabited islet of "Kitriani", on which the unique building is the Church of "Panagia Kipriani" (1732). 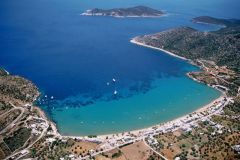 See the location of Restaurant Cyclades Beach at the map.